The day of giving thanks is rapidly approaching. Tuesday night is a good time to burn off that beer-keg-belly or muffin top on the skinny trails of Redland ahead of the feasting. So give yer pie hole a break and get out on the single track of Derwood with some like-minded trailes of questionable character (aren’t they all questionable characters?) 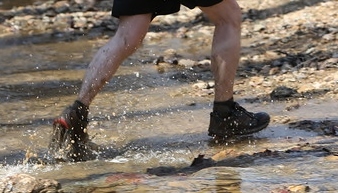 Anyway, c’mon out for our regularly scheduled Muddy Shoes Tuesda…y Trail Run. ***YO, HO, HO, The season of giving is around the corner and what better gifts can you bestow upon friends and family (or treat yo bad self) than Muddy Shoes swag. We got Hats ($15), Buffs ($10) and magnets/stickers ($1). They are going fast! Get yours from Robin (Hats), Phil (Hats, Buffs, Magnets/stickers) or Mike Chau (Buffs and magnets/stickers ($1). ). US Dollars only! Previous Post Outta the Way Tuesday Trails @ Redland M.S.